According to Collider, one of the many projects Guillermo Del Toro has found himself attached to over the years has picked up a new writer. Patrick McHale, creator of Cartoon Network’s acclaimed Over The Garden Wall, has reportedly teamed up with Del Toro to help write his long-in-the-works Pinocchio movie. 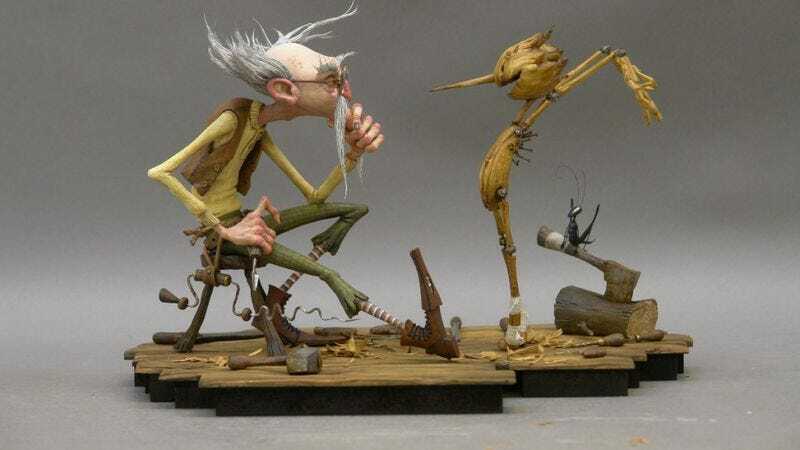 The Hellboy and Pan’s Labyrinth director has spent years talking about his dream of crafting a dark, stop-motion animated version of Pinocchio. The film, which was set to be based on Carlo Collodi’s 2002 book, spun into production way back in 2011, but according to Del Toro, it lots its financial backing and he’s been toying with the script ever since. McHale will be joining him in preparing a new draft. Should Pinocchio fully get off the ground, it would mark Del Toro’s debut as a director of feature-length animation. As he told Collider, he’s been cutting his teeth in that field producing films like Puss In Boots at Dreamworks Animation and, more recently, directing the pilot of Netflix’s Trollhunters. Maybe with that experience under his belt and an Emmy winner helping him polish up the script, this’ll be one of those Del Toro dreams that finally becomes reality. In the meantime, his next film, The Shape Of Water, is set to release sometime this year and stars Sally Hawkins as a Cold War-era scientist who falls in love with a fishman played by, who else, Doug Jones.